In business, there are two ways that you can grow: vertically or horizontally. By this, I mean that you could sell more of your product and related products in the same marketplace. This would be growing vertically. Or you could focus on selling in new marketplaces and channels. This is horizontal growth. We have been working hard for months to build the Web App to support international marketplaces, and last week this came to fruition! The Jungle Scout Web App and Chrome Extension now supports five international Amazon stores: US, UK, Canada, France, and Germany. Expanding your Amazon product sales to new international markets remains an untapped opportunity for sellers. We wrote about the functionality of how to use Jungle Scout for these markets in detail here. It is dead simple. Today I want to share a few tips for how you can use this new functionality to your advantage. Regardless of whether you are selling on Amazon or not, or how much you are currently selling, there are valuable tips here. 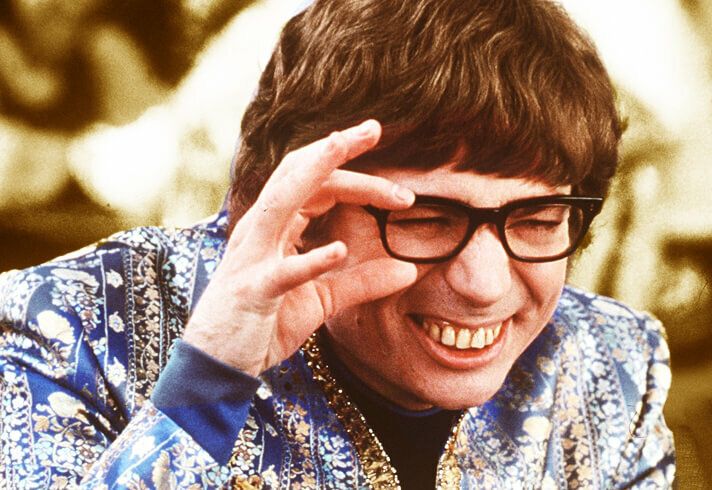 Alright, let me become an International Man Of Mystery wig and see what Amazon product opportunities we can dig up…. If you are already selling on Amazon, the easiest first step with a low barrier to entry is seeing how your product sells in other markets. This is a great strategy for expansion because you do not need to worry about finding your product idea, supplier, importer, package design, product listing, etc. All you need to do is see if there is existing demand in other markets, and if there is, voila….you have a new market to sell in! Note: there is paperwork you need to go through to establish an overseas legal entity for each country (necessary to open an Amazon store overseas). I will cover this in a future post. So let’s take my bamboo marshmallow sticks, Jungle Stix. They have been doing quite well in the Amazon US store, from $10-$27k per month. Is there a market to sell these in other Amazon marketplaces? I have just the solution for that answer…..time to fire up Jungle Scout! There are dozens of search results. I’m curious to see though what the demand for marshmallow sticks is in other markets. Until I sharpen up my German and French, let’s just stick to the English-speaking markets of Canada and UK. My first impression is that there is not a lot of existing demand in these markets. Perhaps s’mores are definitively American? I hope Canadians and English can experience the beauty of a warming, gooey, chocolatey s’more, there’s nothing better! Anyway…..
How do we know if what we are seeing in the lack of sales is based on a lack of supply or a lack of demand? One easy way to figure this out is to look at the search volume, as provided by Google’s Keyword Planner. 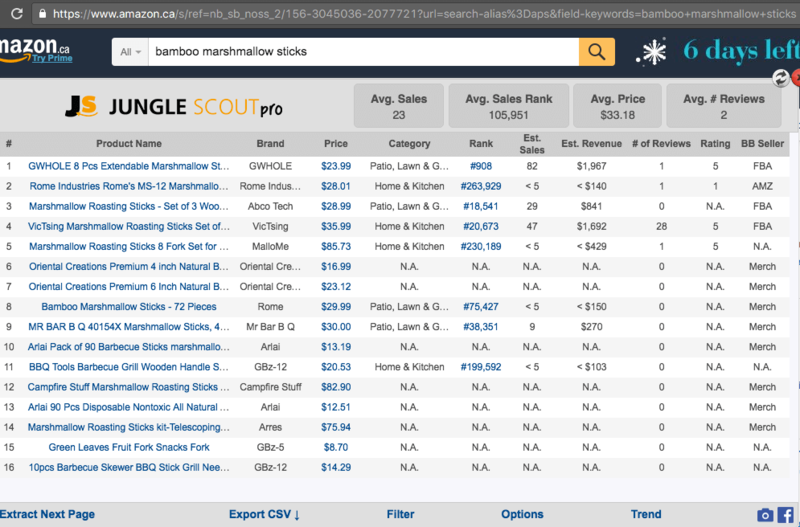 You can get the aggregated search volume for a given keyword, and see how it is distributed across different locations. 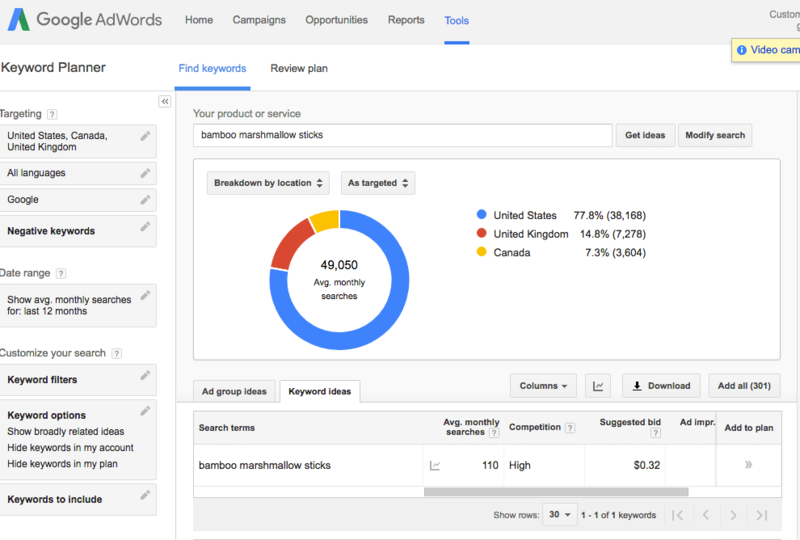 You can get search volume data based on location in Google Keyword Planner by adding your location in the “Targeting” section in the left column. 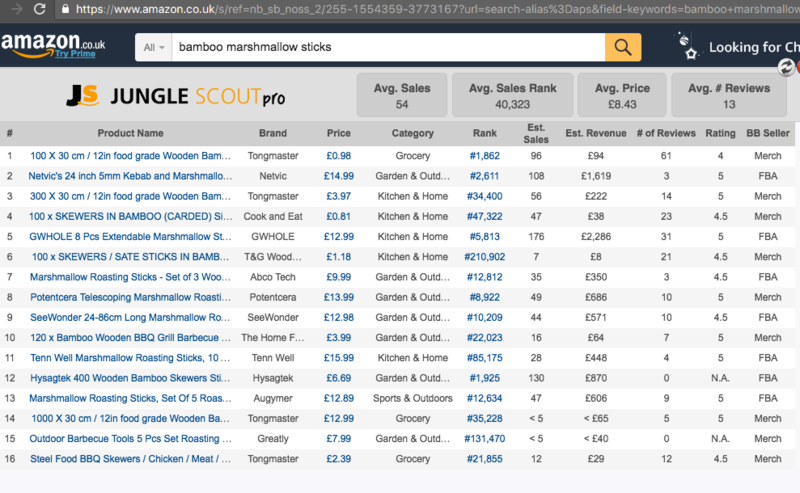 I think that this is more helpful as a method to see the distribution of search volume–so you can see that there are about 5x searches for keywords related to “bamboo marshmallow sticks” in the US than the UK. And there are 2x more in the UK than Canada. I don’t know if this is a home run opportunity in the UK or Canada like it was in the US, but that’s exactly why these research tips are so helpful. Our opportunity will come….as we continue searching. Another strategy that we can use is to find niches that have opportunity in the US, and see if there is also growth opportunities overseas. This is a somewhat related strategy to what we did above, except we are going to cast a much wider net and use a different tool set. Time to fire up the Niche Hunter! The great thing about the Web App supporting the international marketplaces is that it has proprietary ratings for metrics like Opportunity Score, Competition, and Listing Quality Score, specific to each marketplace. 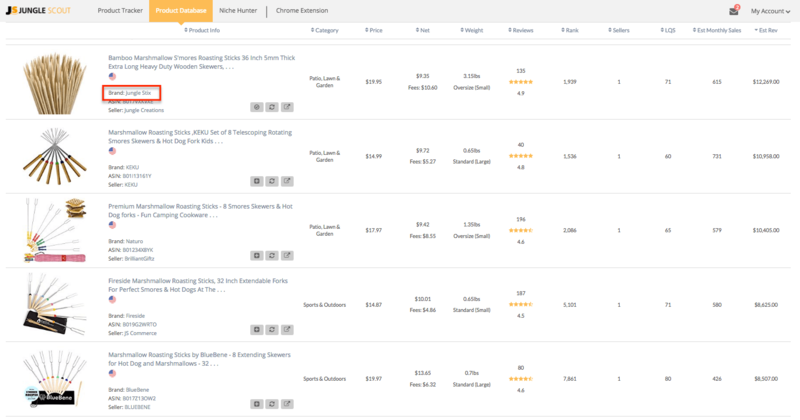 These are some enticing options, as you can see there is significant demand (look at the Average Units Sold column–more than 1000 units sold for each of these products), low competition (looking at the Competition column, our proprietary algorithm shows a low competitive score), and the Opportunity Score is very high–89 and 90! Furthermore, these are some interesting niches that I didn’t know existed, so these may pass my “Weirdness Test” where I am looking for obscure products that are not easily found at your local brick and mortar store. And clicking in on any of these, I can quickly get an overview of how the top sellers in the niche are doing, with sales, reviews, related keywords, and the top sellers for the keyword. From here, I would probably want to pop in “thermal laminating pouches” into the Amazon store that I am interested in selling in, and verify with Jungle Scout’s data estimates that there is in fact demand in other countries. 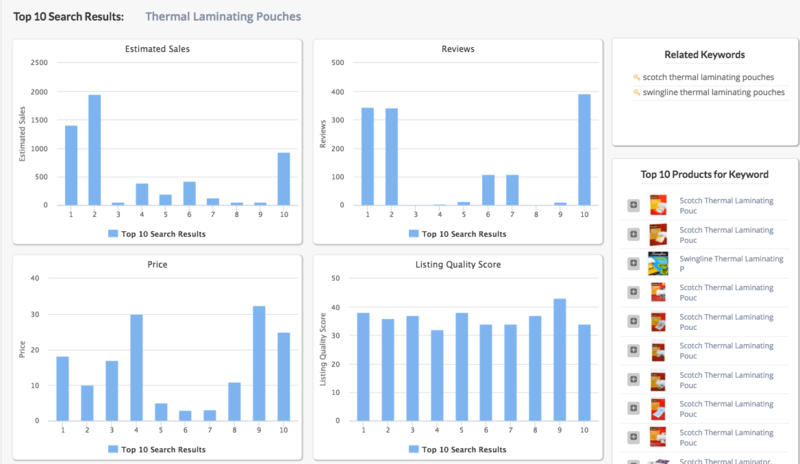 Additionally, I can try the “Related Keywords” that the Niche Hunter shows, adding keywords like “scotch thermal laminating pouches” or “swingline thermal laminating pouches”. The point here is that the Web App–particularly the Niche Hunter and Product Database–have results tailored to the unique countries. 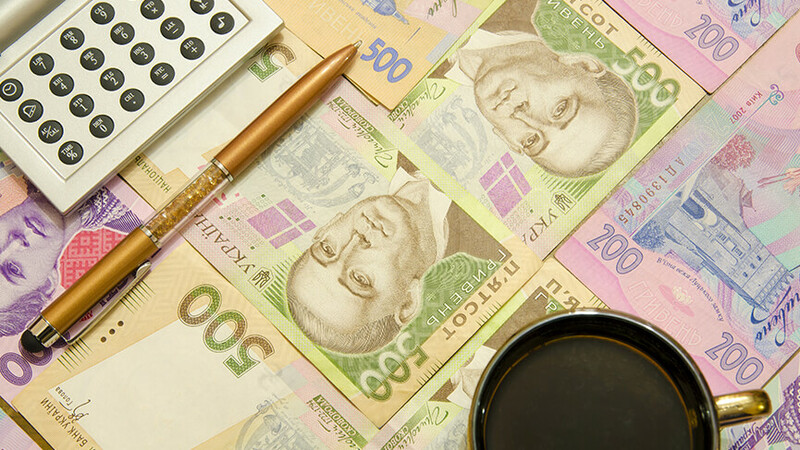 It is like having a cultural translator, sourcing agent, and analyst all rolled into one! I always like to see what is working for other people and how it can be modified and improved. For example, this approach can be used for sellers who sell a lot of product despite having a poor product (as evidenced by a poor rating) or a poor listing (with images, poor Product Title, etc). So all of the results will be private label sellers. Do any of these products look interesting, like they would have sizeable demand if sold in the Amazon US store? These may or may not make the cut of products that I would want to sell, but it is all about generating new ideas and thinking outside the box. Sourcing ideas from a new country is a fantastic place to start. 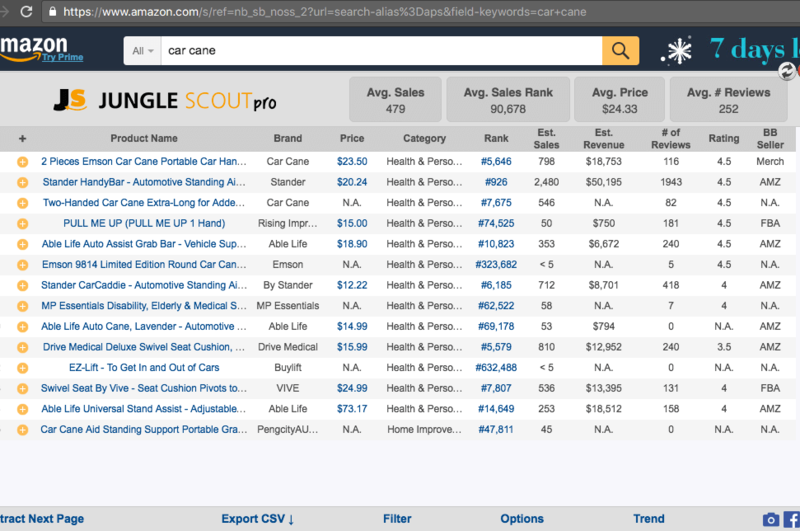 From here, I would drop these keywords into the Amazon US store, and check on how the sales are for these keywords. For example, is there such a thing as a “car cane” in America? So it looks like it does exist, and actually some decent sales! There is some significant demand, and limited competition. 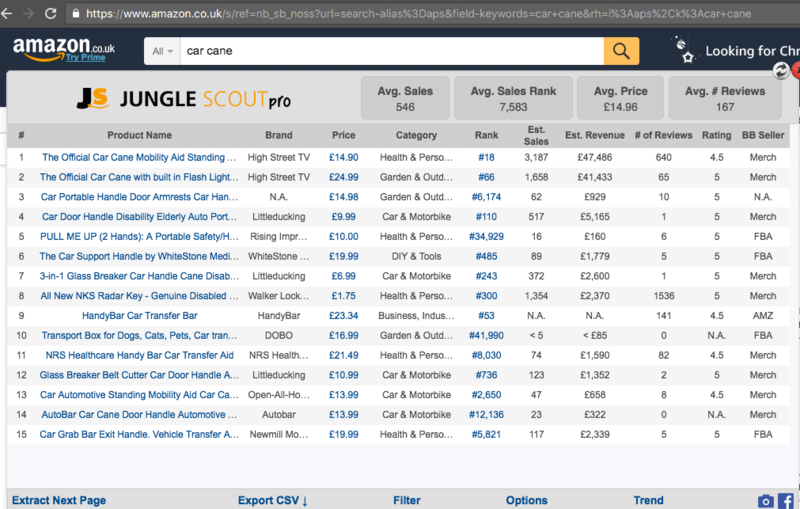 Another way that we could take advantage of cross-marketplace research is by finding new keywords and customer segments to target in our product listing. Essentially, study how top-performing counterparts in other countries market and sell a product similar to yours. 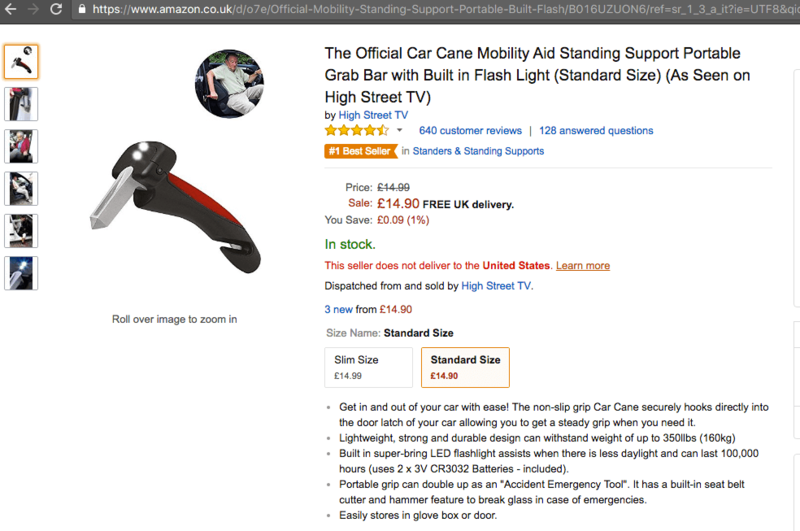 If I were selling a car cane in the US, I might want to look into various keywords (mobility aid, standing support, grab bar, etc), mybe some of the benefits offered (easy storage, portability), or even new product features (a car cane with a flashlight sounds amazingly helpful!). These are all opportunities to improve a listing easily, and there is no doubt that it is working in the UK for this seller. So there you have it, three simple ways to improve your sales, find new product ideas, and capitalize opportunities with Amazon (and Jungle Scout’s) international reach. I will continue covering this topic of international expansion, because I believe that it is a huge opportunity to easily scale a business using existing infrastructure (as in your product, supplier, operations, etc). How do you approach international sales as an Amazon seller? Share your questions or comments below and we can work together to earn….time to get back to work so we can start minting that money. Like lotssss of money…. Hi! Thanks for a helpful article – lots of great ideas to digest. Is JungleScout going to be covering Amazon Australia any time soon? Cheers! I think it’s coming soon, although not entirely sure when. But I can assure you that our developer team is working on it! hi! i am olebile from Botswana(southern africa) .i want to start an Ecommerce store,so i don’t know if it is possible to operate using amazon platform fro my country? My name is Frederick and i live in lagos Nigeria. I’m actually very new to all of this and realise i have a lot of leaning to do before i attempt to start selling.can you guys recommend where exactly i should start learning? Secondly the tables you showed above…..do they cover particular time periods? Hy . I live in Romania .Europe . I want to lunch my first product in Europe. I want to Participate in web seminars here. You can register for the Amazon FBA Program from Romania, just access this page and provide all the information they ask you. For webinars please register for our on demand product research webinar any questions you might have will be answered. What does the metric “Listing Quality Score” means? How do you calculate it? While we can’t give away the exact algorithm, the LQS is a measure of a competitor (or your own) listing quality. It takes into account the length and keyword richness of a listing’s title, its bullet points and description, as well as the number of pictures on the listing and the resolution of the photos. 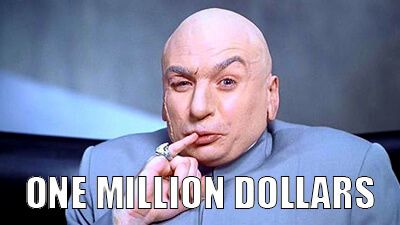 Have you also seen our Million Dollar Case Study: Europe? We are launching our first public product in the UK and would love you to join us in the weekly webinars. Thanks for the info and the compliment! Will you also be listing this product on the other European marketplaces (Germany, France, Italy and Spain)? Do you mean the sleeping bags that I am launching as part of MDCS: Europe? We actually covered this in last weeks session if you want to go and check that out. I think we will, but right now I am focussing on launching in the UK first (walk before I run), which will start to get the sales in and I can iron out any issues before I make my next move. I may actually launch the product in the US too, and perhaps Germany or using the Pan-EU program. Make sure you are signed up for the Million Dollar Case Study as you will get reminders for upcoming sessions that will cover this in the future. Many sellers just list on Amazon UK when starting out on Amazon Europe, but the UK accounts for just 30% of Amazon EU traffic. The additional effort to sell in the other marketplaces (Germany, France, Italy and Spain) is not significant and opens your product up to millions more potential customers, so it might be something for you to consider. Translating / localizing your listings is the only initial step and there is no extra cost to list on these marketplaces. Just let me know if this is of interest. I see Amazon France looks like an attractive market for sleeping bags at first glance! PS – in terms of fulfilment, I would opt for Amazon’s European Fulfillment Network or EFN for now. All of your inventory would be shipped to and stored in the UK, but you would still be able to fulfil orders made on all 5 EU Marketplaces (Amazon UK, Germany, France, Italy & Spain). Pan-EU fulfilment is not optimal for new sellers coming to Europe in my opinion – it allows Amazon to distribute your inventory throughout any of their warehouses in Europe. Your inventory would then be located in 7 countries, which would require you to register for VAT in each of these countries! Quite a lot of work and cost involved in setting this up. Awesome thanks I will bear that in mind when we get to that stage. Selling in Germany or Pan EU is definitely in the pipeline though so keep watching, and thank you for the tips on fulfillment! Best of luck with your launch in the UK! I look forward to seeing how it goes. Great one!! A good read. Thanks for sharing such an informative post for everyone, sellers, customers and digital marketers. Hey Lisa, glad that you found it helpful! would like to see jungle scout working for amazon india. its not working here.